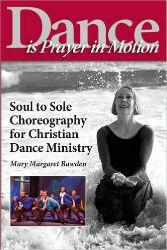 Dance is Prayer in Motion: Soul to Sole Choreography for Christian Dance Ministry written by Mary Margaret Bawden has been released. It’s finally here! A six-step choreography method that results in clear communication of Biblical concepts for ministry. The method works for trained and untrained dancers in ministry settings of all types. Target the choreography you prepare in a clear and focused manner. Develop movement skills that access the technical base of any person that you work with in ministry. Create choreography that changes lives and hearts. Don’t buy into the assumption that skilled dance technique will automatically develop the craft of choreography in you. The two skills are different. This book also clarifies the foundation for Christian dance ministry: leadership skills, dance tools, the rehearsal process, and a chapter for pastors to read, which includes comments from a worship pastor who has worked with Mary for over 20 years. You can buy the book now by clicking here! PLEASE NOTE: All DVD collections are currently being revised and will be offered in 2019! Soul to Sole Choreography is pleased to offer several DVD dance collections, which accompany the book Dance is Prayer in Motion: Soul to Sole Choreography for Christian Dance Ministry. The examples of prayer-in-motion in these DVD collections demonstrate visual examples of the practical 6-step choreography method (including the movement tool of genesis) that has been successful with all varieties and ages of movers, including men. Anyone can learn the method and anyone can apply it to their dance ministry for the glory of God and the edification of the church at large. Each DVD collection is $25. Call 909.793.8925 to order, or fill out our contact form, or send me an email at mary@soultosolechoreography.org. If you know of other websites that you think should belong here, just add the web address in the field below and send it to us.